Tai Chi, also called Tai Chi Chuan, is an ancient Chinese martial art that has evolved into a multiple-element form of exercise, featuring slow, gentle, dance-like movements that encourage deep breathing and relaxation, improve balance, and strengthen muscles and joints. I’ve heard Tai Chi referred to as “meditation in motion.” One benefit of Tai Chi is that is doesn’t require any special clothing or equipment. It is one of the mind-body therapies in complementary and alternative medicine that begins where you are and doesn’t push you beyond your abilities, but does encourage you to explore the edges of your comfort zones. How does Tai Chi help MS? Several studies have examined the effect of Tai Chi on different aspects of living with MS and its symptoms. In a systematic review of the literature, researchers found evidence that supports the effectiveness of Tai Chi on improving quality of life and functional balance in people living with MS patients. A small number of studies also reported the positive effect of Tai Chi on flexibility, leg strength, gait, and pain. The effect of Tai Chi on fatigue, however, is inconsistent across studies. Quality of life (QOL) is a helpful measurement in MS studies because it encompasses physical, material, social, and emotional well-being, as well as personal development and physical and social activity. Five studies examining the effect of Tai Chi on QOL in MS were included in this systematic review. 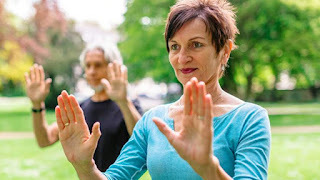 In general, MS patients who engaged in Tai Chi sessions over three- to twelve-week time periods experienced significant improvements on subscales of QOL such as pain, emotional well-being, energy, vitality, social function, health distress, physical health, mental health, and overall QOL. In anticipation of our first year participating in BikeMS, here are some things I did to get ready. To get ready for the ride, I still have quite a bit of training and conditioning to do. Not being a seasoned athlete, I realize that I need to be careful in how I approach getting ready. Here are some of the tips and strategies I’ve learned along the way. Get the right fit. For comfort, safety, and efficiency, your bike needs to fit your body and be adjusted to reduce physical stress and maximize the strength of your efforts. Go to a local bike shop for expert advice. Set realistic goals. Since I can’t already ride 30+ miles, I need to build up to that distance. 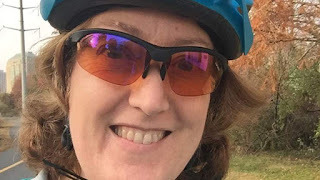 I’m keeping track of my rides with a free phone app (e.g., Strava, MapMyRide) and attempt to increase my average ride by one to three miles each week. Schedule rest. Although it is tempting to think that riding every day will be the best way to prepare, it’s the wrong way to build strength and endurance. Rest days are necessary to allow your body to repair muscle and begin to compensate for the increased physical demand. TrainingPeaks, a free resource for Bike MS participants, emphasizes recovery days and the need for varied levels of workout intensities. Enjoy variety. It’s important not to do the same things every time you go out on the bike. Some training days should feature greater physical demands — increased elevation gain or sprints, for example — or easier, low-intensity spins that keep you moving but don’t wear you out. I like to alternate trails that present different challenges or easier sections. Focus on hydration and nutrition. It’s vital to stay hydrated before, during, and after workouts. The amount of water and enhanced sports drinks you may need depend upon your body, the environment, and your workout demands. The National MS Society offers basic information on hydration and nutrition to get you started.